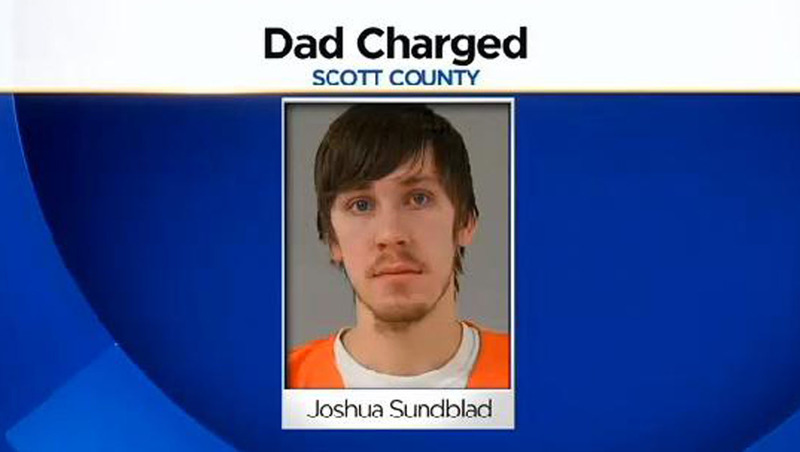 MINNEAPOLIS - A Minnesota dad is charged with killing his 2-month-old son, reports CBS Minnesota. According to the station, 24-year-old Joshua Scott Sundblad, of Scott County, was charged last week with one count of third-degree murder in the May 9 death. The criminal complaint states police responded to a call of a baby not breathing around 5:22 p.m. at a residence in Belle Plaine. At the home, officers encountered Sundblad, who they said calmly led them downstairs to the infant and his mother. The boy was lying on his back on a chest of drawers next to his crib. His skin was a dark shade of purple. Police said officials began chest compressions and administration of oxygen to the baby but were unable to get him breathing. The child was then taken to Minneapolis Children's Hospital where he later died. The boy's mother said she had been at work and came home on her break to find Sundblad sleeping with the 2-month-old, according to the criminal complaint. She told police the infant was purple then as well. She reportedly began yelling and said Sundblad "flew up" when he realized what had happened. She told police the suspect began chest compressions while she checked for breathing. During further investigations, the suspect told officials that his son had been fine for the first month but then began to get fussy, according to the station. The criminal complaint states Sundblad said his mother told him the boy's fussiness could have something to do with the ribs. He reportedly told police the injuries were sustained from him squeezing his son to get a reaction after he hit the boy's head on his knee and the baby's eyes rolled back into his head. The complaint also states Sundblad said the skull injuries occurred when he was bouncing the baby on his knee and he slipped out of his hands. In all, he said he dropped the boy on his knee about four times. The father told police the wrist fracture was from when he was changing the boy out of his clothes and the sleeve got stuck on his wrist. Sundblad said he tugged on the infant's arm and believed that was the cause of the injury. Sundblad said the 2-month-old died when he was in a good mood and that he had not been rough with the child, according to the complaint. He said he wrapped his son up tightly after changing him, but not tight enough to cause breathing issues. The boy's mother said that the baby's mouth was wrapped when she arrived home from work. The station reports medical examiner's ruled the infant's death a homicide. If found guilty, Sundblad could face up to 25 years in prison.